We do not have power or water...occasional internet at our emergency location (and warm showers too.) but we are safe. We did have a tragedy in our town... I will tell you more when life gets a little more normal. Please let me know how you are doing if you were in a storm area. I hope I find you all well. We are hoping for power restoration for next week... in the mean time we are cooking up all our leftover soups and stews on our camp stove and hoping that it doesn't get cold. We do have a fireplace... but it still can get a bit chilly. With this dish I can officially say I am out of my cooking slump!!!! I had to brown apples for a French Friday dish which is how I got the idea of putting browned apples in a simple dish. 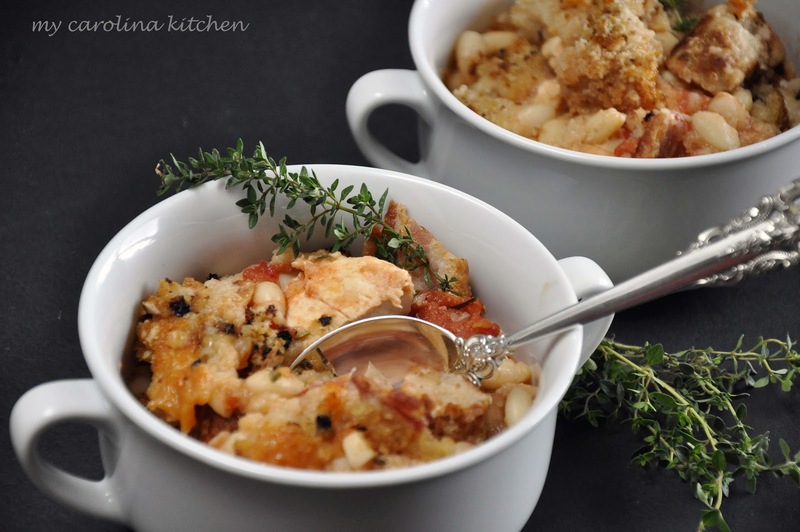 The sage really balances the sweetness of the apples which tastes so good with chicken. My kids loved this dish... I was a little surprised... but I have to admit it is truly seasonally good. 2 large apples of your choice, peeled and cut into diagonal strips. 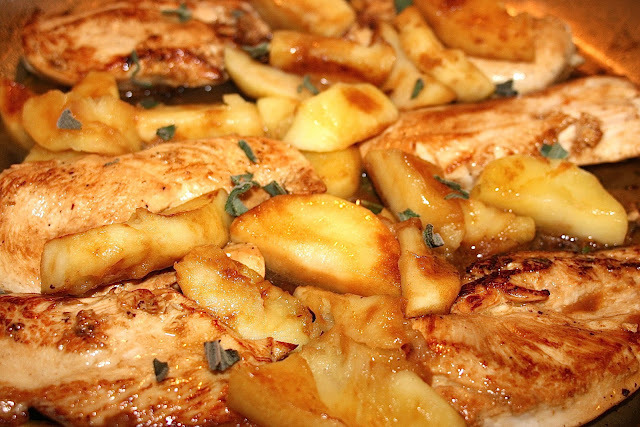 1) While you heat a tablespoon of butter in a large skillet peel and cut the apples. 2) Brown apples until they just start to get golden. Don't over cook they will turn to mush. Remove from skillet as the pieces brown. 3) When you are done browning the apples add another tablespoon of butter to the skillet and sauté the chicken. Remove pieces to a bowl when they are done. 4) Turn the skillet up to high heat and add the wine and sage. Deglaze the pan by scrapping the bottom with a spatula. Continue to do this until the wine begins to get syrupy. 6) Turn the heat off and return the chicken and the apples. Let sit for at least 5 minutes before serving either over rice, potatoes, or with crusty bread. Sausage, chicken, bacon all blended together with incredible seasonings. 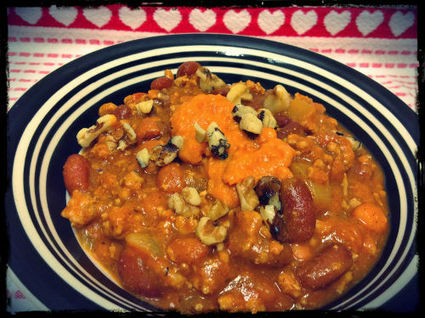 Incredible complexity of flavors in this simple to make chili. I don't know what is more intriguing the cake or the glaze...such a mixture of sweet and salty. My heart and prayers go out to all of you. We went through Hurricane Katrina and others down in New Orleans and really feel your pain. I can say this now from hind sight but really just roll with it and don't get over stressed. Thank you so much. We are good campers so we are doing alright. Thinking of you all and praying you have some normality soon. My heart breaks when I see all the images on tv. I live near the Texas coast but I am originally from Scotland, weather like this doesnt happen in Scotland and so we were caught off guard with Ike a few years back, yet its amazing how people will rally round each other and help. Sandy is different though, I worry about all the people with no heat, so glad you have some warmth. I live in a small town. People are supportive. We are doing OK...just a little tired. I am so glad that you were able to find a way to post and let us know that you are okay. Your Linky is set for 5pm this afternoon instead of 5am, we will all come back to see you then. Keep you spirits high, we are all praying for you and would be there helping you if we could. Our pastor and some other folks are leaving this morning with the Baptist Men to come and help with food and communications. We will keep checking on you. Thanks for letting us know about the linky. Adelina fixed it. Thanks for your love and support. We are not that bad in New York, but one of my sisters lives in New Jersey. They got hit the worst...so strange we are really not used to storms like this here. Glad that you are okay. You and your family will be in our prayers as you continue to recover. 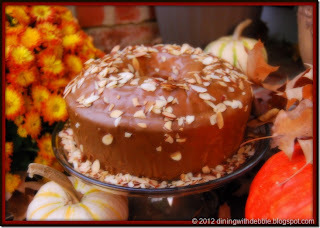 Thanks so much for the feature from diningwithdebbie.blogspot.com. That's really an honor. I will be back to link up when the linky appears today. You are very welcome. Glad you have joined this party. So glad that you could let us know you and your family are all doing okay. I will keep you and your family in my prayers. Good to hear from you Michelle. We are warm and dry and with wifi at our town's shelter. Our house didn't suffer any damage and my family is safe. Thank you for your prayers. So sorry everyone for the linky mix up!! That was my fault! Will do Adelina... we are hanging in there. It's a beautiful sunny day today... which is cheering. So sorry to hear this! Eastern NC usually gets hit pretty hard, but we were very fortunate this go 'round. Glad to know y'all are safe...that's the main thing! I'm so glad that you and your family are okay, but very sad to hear there was a tragedy in your town. Do take care, and I hope things are back to 'normal' soon. I like the sound of your Apple Sage Chicken. Apples always taste so lovely in savory dishes. Thank you for hosting. We had some deaths and it is painful...but we are strong small community and we will cope. I hope things are back to normal soon for you. I'm glad you and your family are ok. It was quite a storm!! Great looking recipe.. Thank you so much for hosting even tho you have so much going on due to the storm right now! I'll keep you in my prayers and hope everything goes back to normal soon! Also a huge thank you for the feature! You are very welcome. Yours is the last comment I get to reply too. back to our quiet house. Diane, I'm so happy to hear that you all are safe ♥ We didn't get any major damage and our power was only off for a little while. You are in my thoughts and prayers. Thank you Lisa. Still hanging in there no power, no water. My husband and I were talking about making your cassoulet when we get the power back. We tried to get into a French restaurant last night... but no luck. It's hard the few places with generators are packed. Glad they got their power back. We are hoping for Sunday or Monday, of course it is getting cold. Glad to hear that you are safe. Hope everything gets back to normal really soon! Your Apple Sage Chicken looks great. Thank you for hosting. I'm glad to hear that your family is safe and sorry to hear that there were deaths in your community. We survived untouched in my town, but some of the nearby beach towns did not fares so well. We are doing what we can to help. I wish you well. The property damage really doesn't matter in the long run... it is the lives and there have been such horrible tragedies in NY and NJ people much too young for death. Glad your OK. I'm soooooo glad to hear you and your family are OK !! The images we've been seeing of the storm's aftermath are shocking! I'm glad to hear you and your family are well. Stay safe and warm. My thoughts and prayers are with you. I can't imagine what it was like to go through that storm, glad hear you are all well and sounding positive! Love your recipe! Very creative! Thank you... so glad I got to cook this recipe before the storm. We had good leftovers to warm over our camp stove. So glad all is "well" with you and your family. I hope things restore to normal soon. THanks for sharing at Must Try Monday :). I hope that your life gets back to normal soon. I am always looking for good chicken recipes. Good to hear you are good. My family is from PA and received some of the storm. They didn't lose power. Thank God. This dish sounds good. I never saw apples with chicken. This got to be good. Great to hear you didn't loose power... I never really cooked apples in a savory dish until this year. My kids loved it. Sending lots of positive energy and good vibes to you as you try to return to normalcy! The recipe looks so good! Can't wait to try it! Thank you Victoria we now have 4 inches of snow, but the winds have calmed down. Have a great weekend and thank you so much for sharing with Full Plate Thursday. Gosh Diane! I hope you're okay now. What a terrible ordeal you guys went through. We were all thinking of you here in Australia. I also want to thank you for the lovely comments you've been making on my blog. I would never have thought to team apple and sage but it sounds lovely. Thanks so much for linking up at Thriving on Thursday. Thank you for your kind words too. I am glad to be through the worst of the storm and our town's tragedy. Now it is time to heal. i'm glad you've pulled through Diane. i can't imagine the stress and pain of being caught in that storm. my thoughts are with you and your loved ones. Yes, Kristy I did have some very good leftovers in my fridge and freezer that got heated up on our camp stove when we were with out power. I am so glad you are doing well. I know you will be happy when your power is back on. We live south of D.C. and were lucky to have no damage. Thank you for linking up to Foodie Friends Friday. I look forward to seeing what you bring next week! Isn't it strange that the areas normally effected by hurricanes were without damage this time. I guess we were due in the Northeast. I hope you enjoy it and send me a link when you blog about it. Thanks Jessica. I love chicken and am always on the lookout for new recipes. This looks delicious! Thanks so much for linking up to Creative Thursday. Can’t wait to see what you share this week! Have a wonderful week.